Fruit Fight Fruit Machine Review - Casino Answers! Fruit Fight is a 3-reel, 1-line fruit machine developed by Cryptologic, featuring a nudge feature, a hold feature, a cash ladder, gamble feature, two bonus games and more. You can play the Fruit Fight fruit machine at [Americans: Unfortunately due to legal restrictions you are unable to play at any of the online casinos this game is at. We recommend you trying playing the unique slots at Win A Day Casino instead.]. Bets on the Fruit Fight slot machine are $0.25, $0.50 and $1 per spin. Each bet is a separate casino game, so when changing bets, you will have to exit one game and open up another one. Fruit Fight has a low betting range that should suit most casual fruit machine players. Whenever you get a win, your winnings will be added to the Cash Pot, which can be risked and lost during gameplay. Press the “Collect” button to add your winnings to your cash balance. Winnings listed under “Safe Bank” cannot be lost. To play the Fruit Fight fruit machine, all you have to do is press the “Start” button. The top-paying symbol on the Fruit Fight pub slot is the Ring Bell symbol. If 3 Ring Bell symbols appear on the center payline, you will win 2000X your bet. The second highest paying symbol is the Stars symbol, which will pay out 400X your bet. After any win on the Fruit Fight slot game, you can collect your win by pressing the “Collect” button. If you’re not satisfied with your win, you can gamble your winnings by pressing the “Hi” or “Lo” button to use the gamble feature. You will guess whether the next card that the Ring Girl holds up will be higher or lower than the card she is holding. If you guess correctly, you will move up one position on the Cash Ladder. You will then have the option of either collecting your win with the “Collect” button or exchanging your win for the Super KO feature board by hitting the “Exchange” button. If you guess wrong, you will lose your winnings. During the regular slot game, you can win up to 4 nudges on any spin you make. Nudges give you the chance to make a winning combination by nudging the above symbol on the reel down to the center position. When nudges are awarded, the “Nudge” button below each reel will flash. The number of nudges will flash on the Nudges Ladder seen at the top right. Press the “Nudge” button to move the selected reel down one position. Repeat this action on whichever reels you choose until you have used all of your nudges. If a winning combination occurs from a nudge, any remaining nudges will not be played. Holds can be awarded at any time during the regular slot game. Holds give you the chance to hold the symbols you want in place and increase your chances of spinning a winning combination. Whenever holds are awarded, the “Hold” button below each reel will light up. Press the “Hold” button to hold the corresponding reel. If you do not wish to hold any reels, simply ignore it and keep spinning the reels. Press the “Start” button to hold any reels that are not being held. Any win you spin during normal play on the Fruit Fight online slot game will be displayed on the Cash Ladder. The Cash Ladder is found to the left of the Boxer and the Nudges Ladder. To climb the Cash Ladder successfully, you must guess whether the number the Ring Girl is holding will be higher or lower than the current one. If you guess correctly, you will move up a rung on the Cash Ladder. If you guess wrong, you will lose your winnings and return to the regular slot game. You can collect your winnings at any time by using the “Collect” button or exchange them to play the bonus game by using the “Exchange” button. If you successfully move up to the Jackpot level on the Cash Ladder, you will automatically collect your jackpot. Fruit Fight features two bonus games. The first is the Super Knock Out feature board. This can be triggered when 3 KO symbols appear anywhere on the reels of the Fruit Fight slot game. Exchanging a win on the Cash Ladder can also trigger it. Press the “Start” button and the Ring Girl will determine the number of squares you will move on the feature board. Each square on the board triggers one of the various board features. Among the features on the Super KO feature include multipliers, Cash Boost, the Lucky Dip feature, triggering the Super Heavy Weight feature and much more. If you land on a “KO” square, the bonus game will end. Use the Super Knockout feature board bonus game to unlock many special features and win lots of cash at [Americans: Unfortunately due to legal restrictions you are unable to play at any of the online casinos this game is at. We recommend you trying playing the unique slots at Win A Day Casino instead.]! There are many other features on the Fruit Fight AWP slot game. In the Lucky Dip feature, you will click on squares to reveal symbols. If you match three symbols, you will win the corresponding amount for those symbols as displayed in the paytable. For Cash Attack, the message box at the top will flash cash amounts until you press the “Stop” button. You will get to do this three times and the total sum of the cash amounts you land on will be your cash prize. In Hi/Lo Crazy, you will press the “Hi” or “Lo” buttons to punch your opponent. If you hit him, you will win a cash prize. You will have six chances to punch your opponent. In Birdy Bucks, a boxer has been knocked out with birdies flying around his head. Choose three of the birdies to win a cash prize. If you get the Turbo Cash feature, the Cash Ladder will light up randomly. Simply press the “Stop” button when you think it the light is closest to the top of the ladder to win your prize. In the Saved By The Bell feature, you will win 5 free spins. During each free spin, the number of Ring Bell symbols will be added up. The number of Ring Bell symbols is then multiplied by the Cash Ladder you were on when you triggered the feature. If you trigger the Power Punch feature, you will win a prize based on how hard you can hit your opponent. Press the “Stop” button to stop the power bar at the highest level possible. The Boxer will then punch his opponent with the power selected. The opponent will get knocked down for a count of between 1 and 10. However long the opponent is down for will be the multiplier you are awarded. That number will be multiplied by the Cash Ladder rung you were on to award you a cash prize. All symbols pay left to right in consecutive order only. Only the center payline counts towards the Cash Ladder, Wins are paid in accordance with the Cash Ladder. Highest win only on the payline will be awarded. There are 9 winning combinations on the Fruit Fight AWP fruit machine. The complete payout schedule is as follows (payouts in parenthesis): 1 Boxing Glove symbol (2), 2 Boxing Glove symbols (4), 3 Boxing Glove symbols (8), any 3 Seven symbols (8), 3 Yellow Seven symbols (12), 3 Blue Seven symbols (20), 3 Red Seven symbols (40), 3 Stars symbols (400) and 3 Ring Bell symbols (2000). The Fruit Fight fruit machine is a superb casino game that UK players especially will have loads of fun with for all of its amazing special features. Fruit Fight offers everything from a gamble feature to two feature boards and lots of little special features to sweeten the pot inbetween. You can try out all of these special features on the Fruit Fight slot game when you make a deposit and play at [Americans: Unfortunately due to legal restrictions you are unable to play at any of the online casinos this game is at. We recommend you trying playing the unique slots at Win A Day Casino instead.]! Can I play a free flash game of the Fruit Fight UK slot machine? Unfortunately, there is not currently a Fruit Fight flash game available. 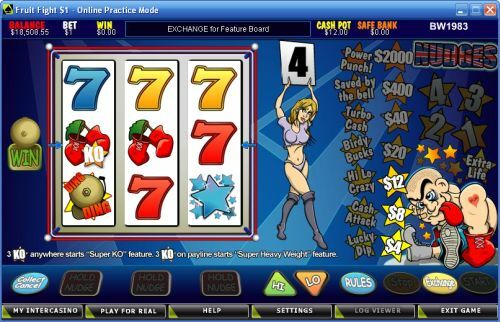 For lots of instant play fruit machine flash games, please visit a Microgaming casino like Bovada. Can players from the USA play the Fruit Fight online slot game for real money? Unfortunately, if you are located in the USA, you cannot play the Fruit Fight slot machine for real money at this time. Instead, you can play one of the many excellent interactive slot games like Heavyweight Gold at Bovada. Where can I read more fruit machine slot reviews? You can read more Microgaming and Cryptologic fruit machine reviews on our list of fruit machines at online casinos. Where can I read more boxing-themed slot machine reviews? If you’re looking for a good boxing slot and you haven’t found it with Fruit Fight, we recommend you read our list of sports-themed slot games. Not only can you read boxing slot reviews, but you can also read reviews of football slots, hockey slots, horseracing slots, auto racing slots, rugby slots and so much more!